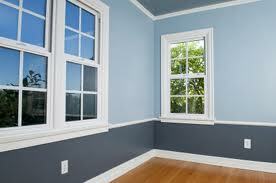 Interior painting is probably the most enjoyable upgrades you can do to your home. A fresh coat of paint on a wall or ceiling will brighten up the room and make you feel even better about your home. Painting is more than just changing the color scheme inside the house, but it’s important to use the right paint for the right surface. You may already know, but it’s recommended to use a semi-gloss or gloss paint on the walls of bathrooms, kitchens, doors and even trim. This type of paint is more durable and is able to with stand the moisture in the bathroom and with it being washable, it also works well in the kitchen. Flat paints are usually used on the walls and ceilings and help to hide minor blemishes in the sheet rock. Prices for interior painting vary depending on the size of the job, number of custom colors to be used, amount of trim, the number of door & windows. Contact us today and we’ll set a time to take a look at what you want painted and provide you with a free estimate. We’ll bring a color chart along and go over some paint choices with you if haven’t chosen your interior colors.